On a recent Monday morning, Chyna Foster was touring the halls of West Catholic Preparatory High School on Philadelphia’s working-class West Side. Dressed in her uniform — a gray skirt and blue cardigan — she offered a “Good morning, Sister” to a teacher, passing portraits of alumni who had made their mark on the school since its founding in 1916. A friend and relative of many alums, Foster, 17, had little doubt she would enroll at West Catholic rather than her neighborhood high school when she graduated from middle school three years ago. But had it been just two years earlier, Foster might not have been able to follow in their footsteps. In 2012, the school was one of nearly 50 put on the chopping block by the Archdiocese of Philadelphia in the face of a 35 percent drop in Catholic school enrollment over the previous decade. At West Catholic, the building that had once held about 3,000 students had just 236. But today, due to the efforts of entrepreneurs and educators — and a surprising willingness by the archdiocese to hand control of every high school and more than one-quarter of its K-8 schools to two nonprofits — things have turned around dramatically. Instead of declining, enrollment has soared (at West Catholic, the student population has almost doubled, to 410); instead of budget cuts and ballooning debt, some schools are boasting of surpluses; and instead of charging tuition that is out of reach for poor families, the schools are providing more financial aid. Spurring the revitalization was a combination of a business approach to school administration and a revamped state tax credit scholarship program that encourages wealthy donors to help needy students cover their tuition costs. Now, Carter is hoping to expand its reach through federal investment in a voucher program proposed by President Trump. 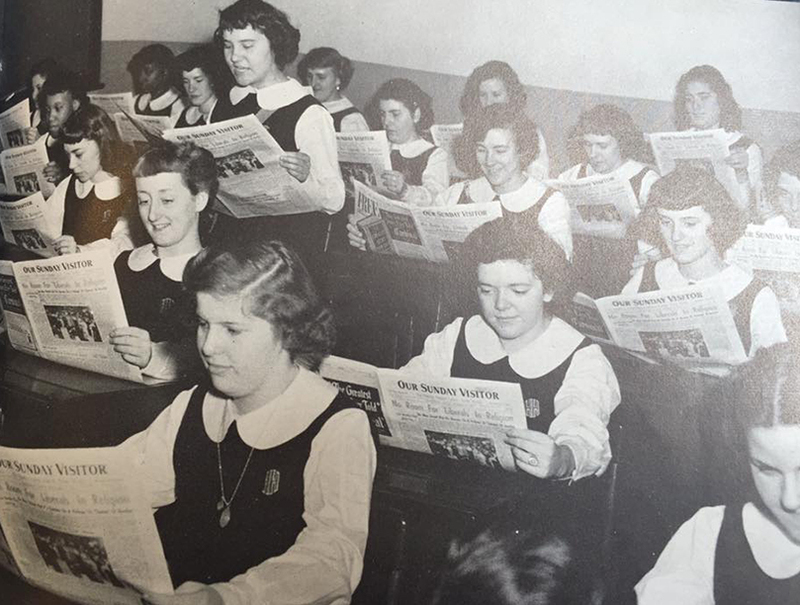 Though the first Catholic schools opened in Philly in the late 18th century, their heyday was the first half of the 20th century, as an influx of immigrants sent enrollment soaring. The student population exploded from 68,000 in 1911 to 271,088 in 1959, according to the archdiocese. Those flourishing schools came to define Philly’s neighborhoods, where residents often identified themselves by the parish they attended. But in the past 50 years, enrollment dropped dramatically, the result of a declining city population and, more recently, competition from tuition-free charter schools. By 2011, the archdiocese had just 68,070 students, the same as 100 years before, in 177 schools. As student enrollment and tuition payments declined, local churches increasingly had to subsidize their schools. Dozens of schools found themselves with significant deficits, while their parishes were juggling huge debts of their own. 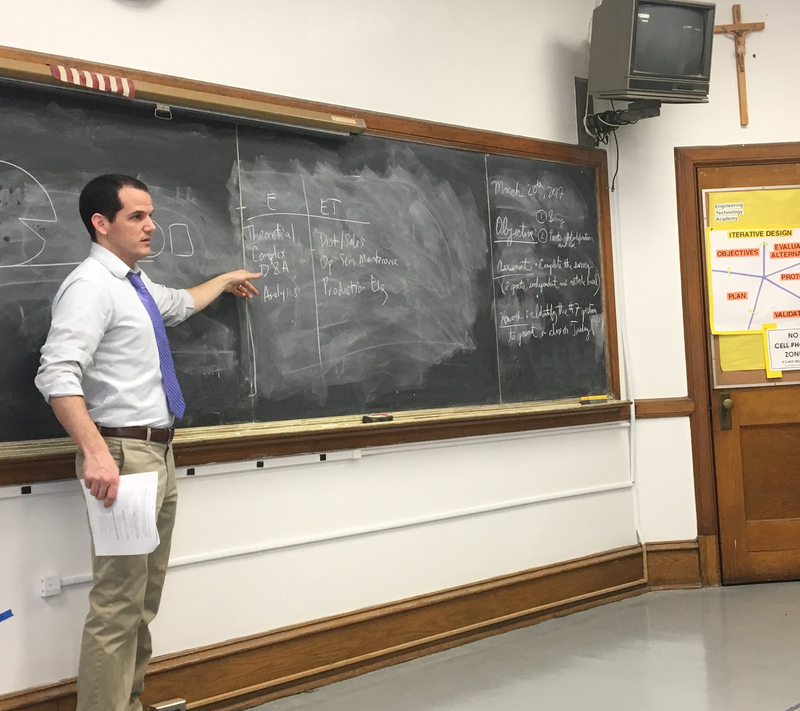 It was an unsustainable financial situation, and in response, five years ago, the archdiocese appointed a blue-ribbon commission to chart a course for the city’s Catholic schools — many of which were struggling, with no viable plan for recovery or future growth. The commission recommended closing or consolidating 40 to 45 of about 156 elementary schools and four of its 17 high schools, including West Catholic. In the outcry and negotiations that followed, the commission and Archbishop Charles Chaput agreed to allow schools that could present solid viability plans to stay open. Independence Mission Schools, which had been founded by wealthy donors and was already running one Catholic school in an extremely poor neighborhood, took over the operational and financial management of 15 K-8 schools in the city and suburban Delaware County. The newly created Faith in the Future foundation assumed control of 17 high schools and four special education schools. Coincidentally, at the same time, Pennsylvania was preparing to send Philadelphia’s Catholic schools a legislative lifeline. In 2001, the commonwealth had created the Educational Improvement Tax Credit program, which gave businesses tax benefits for donating to nonprofits that could award up to $60 million in K-12 scholarships. Then, in 2012, Pennsylvania approved the Opportunity Scholarship Tax Credit program, giving additional tax credits for donations to private school scholarships for students in underperforming public schools. Since then, about three-quarters of the funds for the tax credit programs have gone to religious schools, according to a recent report. 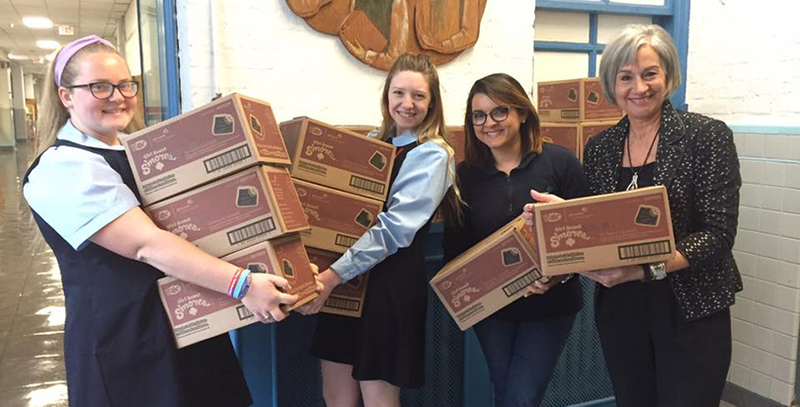 The result: Two outside organizations have managed to turn around a centuries-old school system using modern-day business practices — a feat that few dioceses around the country have been able to accomplish. From 2012 to 2015, scholarship donations to Independence Mission Schools increased from $1.8 million to $9.7 million and enrollment grew from 3,800 to 4,800, according to a recent financial report. 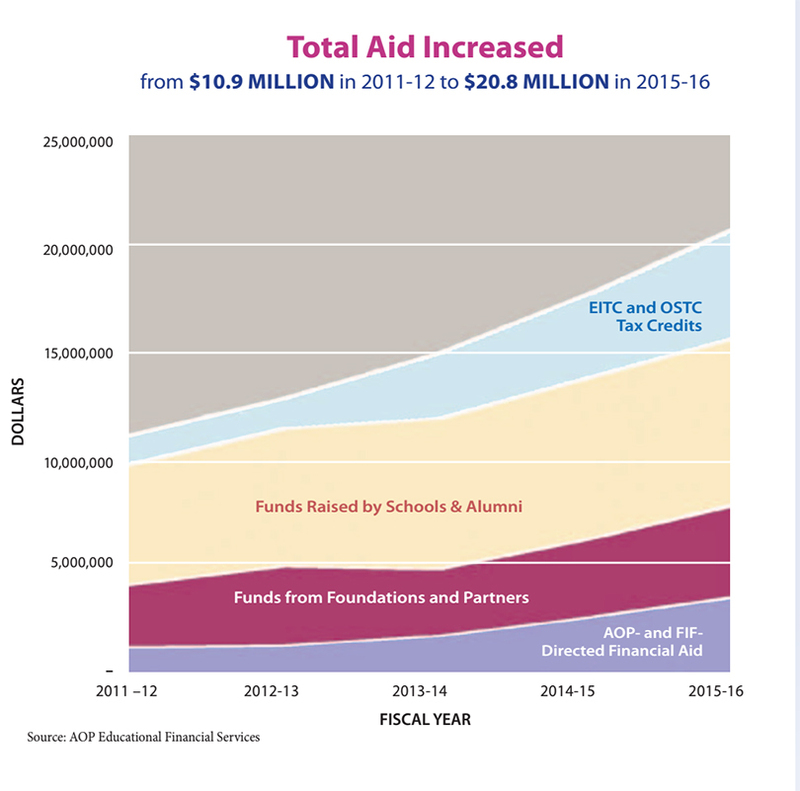 For Faith in the Future, better fundraising from alumni and the tax credit scholarship programs allowed for a boost in financial aid from $10.9 million in the 2011–12 school year to $20.8 million in 2015–16. The annual decline in student enrollment has slowed, and the foundation projects modest growth for next academic year. Foster, for one, has benefited from the tax credit scholarship program and two other scholarships that together cover half the cost of West Catholic’s tuition and fees, according to her mother. Two tax credit scholarship programs and increased outside donations have helped give more kids scholarships to Catholic high schools in Philadelphia. One of the first challenges for Faith in the Future was identifying the best people to run its schools in the new era. Instead of religious or lay leaders — who were still invaluable in heading up religious instruction — Carter wanted business people skilled in the fundraising and marketing that were essential to the schools’ survival. Banker Denise Kassekert, for example, was serving on the board of John W. Hallahan Catholic Girls’ High School, her alma mater. She volunteered to “help out” while the board searched for a new president — and before she knew it, she was being tapped to lead the school. Another challenge was making each school responsible for setting its own budget, hiring its own educators, and conducting its own marketing campaigns, while creating a centralized purchasing system and streamlining accounting and tuition collection. The foundation also used the boost in fundraising to make capital improvements, repurposing unused convents in some schools as dorms for international students, who often pay full tuition. “[We tried] to figure out how can you prepare and build on the tradition that was existing while getting schools to understand that the business conditions have changed and so, therefore, they need to be operated and governed differently,” Carter said. That dual approach of preserving tradition while changing operation and governance applies to academics as well — and is personified by Carter himself. Denise Kassekert (right) left her decades-long career in banking to become president of John W. Hallahan Catholic Girls’ High School. A former Benedictine monk, Carter taught at a Catholic boarding school in Rhode Island before becoming president of National Heritage Academies, a for-profit company that operates charter schools in nine states and serves more than 50,000 students. 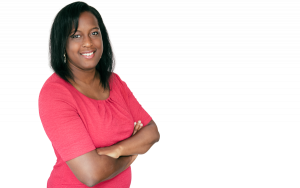 As an education consultant, he has advised clients such as the Cristo Rey Catholic school network and KIPP Public Charter Schools, as well as for-profit school operator K12 Inc. He has written two books on education: No Excuses: Lessons From 21 High-Performing, High-Poverty Schools and On Purpose: How Great School Cultures Form Strong Character. While preserving traditional Catholic education, with its rigorous academics and deep religious roots, was a must, Carter was also determined to add education reform elements of the type found in the charter schools that have given the archdiocese’s schools such stiff competition. To raise academic standards, the foundation started focusing on digital assessments to track students’ progress in reading and math against national norms three times a year. Those scores are used to identify groups of students who might need extra support in, say, critical reading and offer more professional development to their teachers. Carter is also open to having students at foundation schools take state standardized tests, which Catholic school students in Philadelphia currently do not do. Going forward, the foundation wants to continue to look at ways the network can support the schools’ individuals needs — whether it’s technology upgrades, social services, or more educator training. To Carter, the foundation’s successful growth strategy is evidence that Washington should create a voucher program, particularly for students at underperforming schools. Trump and Education Secretary Betsy DeVos are staunch voucher supporters, and on Tuesday the administration proposed a budget that calls for $250 million to support expanding private school vouchers. That proposal attracted opposition from Democratic lawmakers, who argued during a congressional hearing Wednesday on Trump’s budget that vouchers divert sorely needed funds from public schools and fund private schools that are not held accountable for their results. Pennsylvania lawmakers are having a similar debate around a proposal to expand the state’s tax credit scholarship programs. In March, the state House of Representatives passed legislation to add $75 million to the scholarships. The bill is now at the state Senate education committee. A number of new studies show that voucher students don’t score higher on standardized tests and may do significantly worse. But older research suggests voucher participants may have higher graduation and college attendance rates. By the time Paul Colistra arrived at West Catholic High School in 2012, it had already seen many transitions. Begun as a boys school in 1916, it eventually served some 6,000 boys and girls at campuses and annexes throughout West Philadelphia. In the 1950s and 1960s, the white middle and working classes moved to the suburbs, replaced by working-class African Americans. Then, in the 1980s, the crack epidemic swept through the area, as in many parts of the city, boosting crime. And though crime eventually dropped, the student population continued to dwindle. In 2012, there were only 236 students left. Colistra started at West Catholic as vice president of institutional advancement just as the archdiocese announced the closures. An influx of donations and the commitment from the Faith in the Future foundation followed, and the school was renamed West Catholic Preparatory to signify a new era. In the summer of 2016, Colistra became president. One of his first changes was to hire more teachers, decreasing class sizes from around 25 students per teacher to about 17. Staffers were brought in to assist the school’s one full-time admissions officer and its sole fundraiser. This year, the school hired a social worker to address challenges that students face at home during their freshman year, when they are most likely to transfer or drop out. West Catholic also boosted its financial aid program. Today, few families pay the full $8,000 tuition; most pay about $3,500. The average student is African American and comes from a family that makes about $32,000 a year, Colistra said. 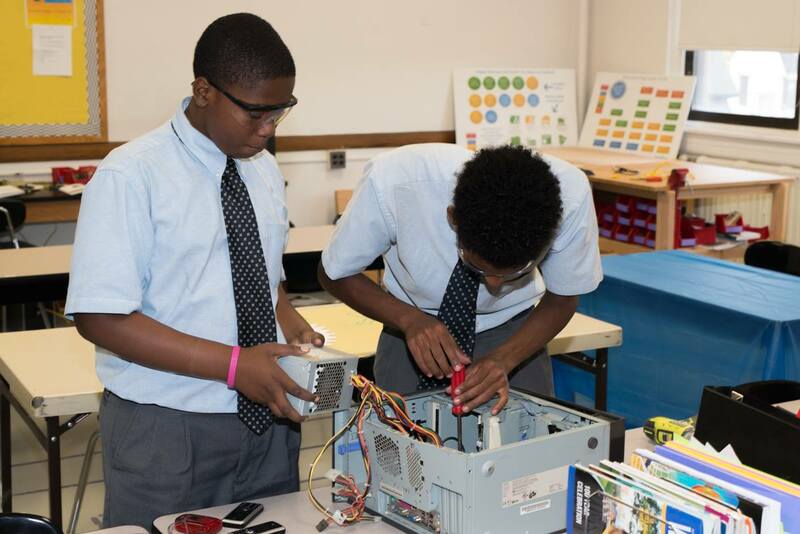 And, the school has formed strategic partnerships with universities, including the University of Pennsylvania, which helps train student leaders in management, and Drexel University, which helped West Catholic launch its Engineering Technology Academy in 2014. The four-year program gives select students training in basic engineering skills, with a project-based curriculum and the chance to earn college credits. Ryan Baxter teaches a class in West Catholic’s Engineering Technology Academy. By far, one of the biggest investments the new leadership made was in marketing. In its second year, West Catholic Prep plastered local buses with ads announcing that it was ready to accept students. Colistra also formed partnerships with elementary and middle schools both inside and outside the parochial school system to make West Catholic better known to families. Colistra and other school leaders attend elementary school plays to talk to families and host lower-school events at their much larger campus. Colistra also regularly speaks with leaders of K-8 schools about what West Catholic has to offer. Since Faith in the Future took over the school five years ago, enrollment is up to 410 students, and the school hopes to boost that number to at least 600 over the next five years. In the future, Colistra said, he thinks the school will attract families by advertising and strengthening its engineering academy, as well as providing strong teaching in core academic subjects. 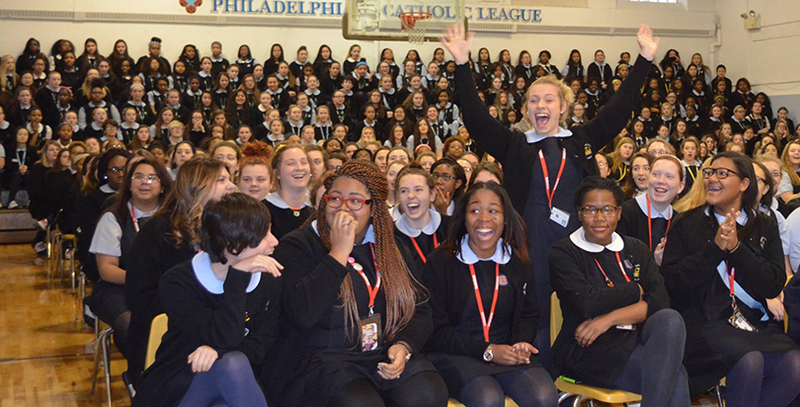 In February 2016, the Archdiocese of Philadelphia announced that it was extending its contract with Faith in the Future to manage its high schools and schools of special education through 2022.